Buon giorno. Atheists really wonder why they are the least-liked, least trusted group? Amazing, innit? Here are more examples of obnoxious atheists misbehaving like juvenile delinquents that are desperate for attention. When atheists get called on their petty tricks, they play the victim card. Agonizing. First, can you really believe that they are silly enough to think that we'll believe their story that this is an attempt to "increase communications"? Mislead me again, Marvin! "They say their ad is intended to spark dialogue with people of faith on the existence of God, but you don't draw people into conversation by poking fun of the beliefs," Glenn Stanton, director for Family Formation Studies at Focus on the Family in Colorado Springs, told The Christian Post. Read the rest of the story on the obnoxious atheist billboard here. Here we go again! Atheists hate laws that protect anything that would allow Christian speech, it seems. Here is a case of blatant disregard of the Equal Access Act, which allows student-run Christian groups the same rights as other student-run groups at school. But no, atheist bigotry wants the laws ignored and discrimination to rule the day. A newly appointed state director of an atheist activist group said that he will fight two national Christian-based organizations for what he alleges to be proselytizing at public schools while "targeting the impressionable minds of our children." Al Stefanelli, the former president of United Atheist Front and presently the Georgia state director for American Atheists, Inc., said he will take action against the Child Evangelism Fellowship and the Fellowship of Christian Athletes this year. Both groups conduct after-school and break-time activities on school campuses throughout the United States with the approval of school officials. When asked by The Christian Post as to what actions he would take against these groups, Stefanelli said, "I cannot get into specifics at this time, as we are still in the planning/strategizing stages. You can be confident that we will, as always, operate within the law, using peaceful means." Operating within the law? This whole thing is a blatant disregard of federal law! When atheists wonder why I don't trust them, I can show them this, capice? Anyway, you can read the rest of "Atheist Activist Targets Two National Christian Fellowships" here. Atheists gang up on a Christian film to give it low ratings. In some ways, this is nothing new. I see atheist trolls attacking all the time, giving low ratings to books, YouTube videos, music, movies, whatever. There is nothing honest about this, they haven't actually read the books, they just attack. (One memorable review is about atheist S.E. Cupp's book, the reviewer said that she's not really an atheist because she was not vitriolic! I guess it means to be a true atheist, one must be an obnoxious jerk?) These people wonder why we shut off the comments on the Question Evolution Day Page on Facebook; trolls attacked, left inappropriate (and extremely off-topic, and extremely illogical) comments. So, in some ways, this is typical of modern obnoxious Internet atheist behavior. Read the rest of "'Suing the Devil' Filmmaker Alleges Online Atheist 'Mob Attack'" here. Buon giorno. I am not exactly comfortable with doing book reviews, since I have done so few of them. Especially fiction. That may be to my advantage, however. I'll just be myself instead of using some kind of formula and say what I think, but not ruin the story for anyone, capice? This is the first ebook that I purchased. I was so certain that I was going to get the Kindle that I bought the e-book before I even owned the Kindle. Are you flattered, Mr. Slick? Yes, that's right, Rev. Matt Slick. The same guy that I talk about, link to and give you audio excerpts from is also an author. And yes, it's his real name (he learned that his ancestors had a longer version of the name, though). Bottom line first: I was entertained by The Influence. In fact, I gave more time to reading than to do my writing and research. It had been quite a while since I read a book just for the pleasure of it, and it delivered. 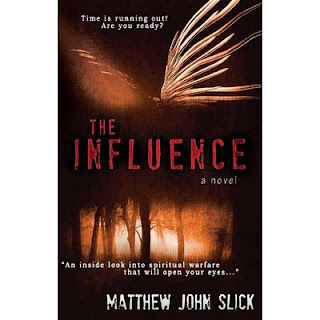 This book is about angels and demons, and warfare in unseen places. It also has discussions in theology, because Mark, the main character, is granted the rare privilege of seeing and speaking with an angel. (On a side note, I have seen it before where characters have discussions so the author can present a viewpoint. Fortunately, The Influence is not like Genesis, the flying saucer conspiracy book by W. A. Harbinson — that fat baby seemed to spend two thirds of the time in tedious, unbelievable dialogue and low on the promised "searing terror and explosive excitement"). Mr. Slick makes the demons genuinely evil, and not just troubled, misunderstood or misguided with hidden goodness deep inside. Evil is not sugar-coated here. Matt took some literary license in his descriptions of the demons and of the action because the Bible does not give us those details, and he wanted to be as Biblically accurate as possible. The theological discussions are informative, of course, since Rev. Slick is a theologian and an apologist. I am pleased to say that the theology does not get mind-numbingly deep or go into specialized denominational interpretations. Also, the discussions are broken up with page turning (well, on Kindle, screen tapping) excitement. Things that I thought I could predict ("Oh, she's gonna die here!") that happen in lesser stories did not happen here, fortunately. I'm going to give one thing away that is important to the story, and the story making. One thing that startled me was when reference was made to the death of an infant, his name was Jacob. Matt and his wife lost Jacob shortly after his birth. He brought his own pain into the story through the character of Mark. Don't get me wrong, it's now a "downer". There is humor in the story as well, and the characters were far removed from the cardboard cut-out Pollyanna-style of other Christian fiction that I have read. (Good characters are important to me; I have watched movies or television shows and actually missed the plot because I was so taken with well-written, acted and directed characters.) So, if you want people that can make you feel something, Mr. Slick wrote them for you. Speaking of feeling something, there is a vision that someone has at the end of the book. I will only tell you that it got to me, and I left the living room for a while because I did not want to bother She Who Must Be Obeyed with my sniveling. 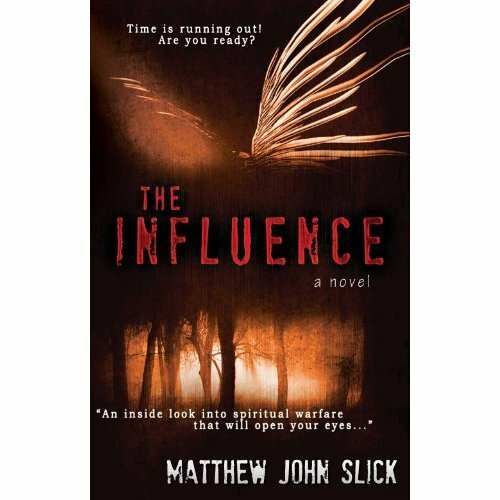 I recommend The Influence. You will be entertained, and you will probably learn something. Buona sera. It's been a while since I talked about my buddy Neil. Since he had some circumstances that fit in with what I've been talking about off and on the past few months, he's in the spotlight. Wave to the nice people, Neil. I'm telling your story. At the Big Soulless Corporation where he works, there was a kind of "meet and greet" for new employees. One of the higher-level managers facilitated the thing, made announcements, had people introduce themselves and so on. Some of the questions he asked made Neil a bit introspective. He went up to that manager later, after most of the crowd had dispersed, and said that he had changed a great deal over the past few years. "In what ways? ", the manager asked. Neil mentioned that he liked reading apologetics and logic things (including mine). When asked, "What the hell is apologetics? ", Neil told him that it was the defense and presentation of the Bible and Christian faith. "Oh, religious stuff, then", the manager said. At that moment, a managerette that was standing next to him said, "This is where I leave! ", and briskly walked away. This strikes me as amazingly rude, too. Neil and the manager continued to talk a bit after that. There was no preaching, Bible quoting or anything of that nature. The next day, a lower-level manager told Neil that the other ones were flustered because "You're not supposed to talk about religion here". Neil startled her by saying that such a directive is discriminatory. (One Mafioso was reported to have told people under him that they cannot wear "religious" jewelry and so forth. I can see frowning on a "repent or burn in Hell" shirt, but he's overly restrictive.) If they make a fuss or try to do gag orders, Neil is more than willing to get them straightened out by Alliance Defense Fund, Liberty Counsel, Rutherford Institute and others. Big Soulless Corporation is terrified of negative publicity, and they would get it in spades. Hypocritically, the Big Soulless Corporation allowed a big astrological symbol to be prominently displayed on a white board. Neil had to see this every day for over a month, and was offended by it. But he didn't act like a whining leftist, he just tolerated it. BSC claims to value "relationships", "integrity", "compassion" and other stuff — all of which Neil has seen proved to be lies. They also claim to respect "diversity", including race, age, culture, experience, background and so on. Yet, they demand uniformity of performance. Pretty much a clone club. So, there is Neil's example of religious discrimination. But I promise you, if he was a Mohammedan in full garb, no manager would dare say anything about it, capice? It's "in" to kick Christians today, you know.